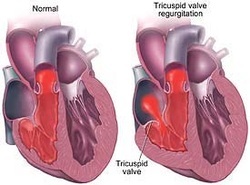 The causes of tricuspid regurgitation are rheumatic heart disease, carcinoid syndrome, endocarditis, cor pulmonale, pulmonary embolism, chronic obstructive pulmonary disease, pulmonary hypertension and drug abuser as well as carcinoid syndrome. Tricuspid regurgitation may present with raised jugular venous pressure to the ear and also present with giant V waves. There will be parasternal heave. Patient may present with pansystolic /holosystolic murmur which is louder in inspiration at the left sternal edges. Tricuspid regurgitation may present with edematous lesion. Patient with tricuspid regurgitation may also complain of ascites.